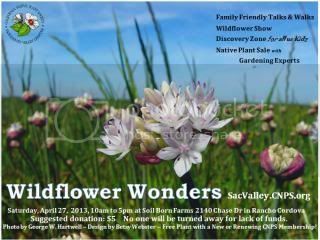 My first featured event for the week is the Wildflower Wonders event that the Sacramento Valley CNPS chapter is putting on - April 27. All they ask for is a $5 donation - and the event features some neat Walks & Talks and an all-day Native Plant Sale. Saturday, April 27 is the Apple Blossom Trail Run up at Apple Hill. There are other corresponding events like the Apple Blossom Days at Lava Cap Winery. They'll have complimentary tastings, cheese pairings and other deals. If you are a fan of Mexican food - and want to support the Effie Yeaw Nature Center - head on over to El Papagayo's on Marconi Ave (at Fair Oaks Blvd.) for some dinner either April 24 or April 25. If you bring this flyer with you 20% of your bill goes to support Effie Yeaw. Oh - and if you go on Wednesday you can get a free draft Modelo. Yah. I think no free beer for me. I'm hoping we'll all be busy and won't be able to go out to eat at all... but I have a feeling that mom, dad and jonny will all get free beer on Wednesday... Maybe some spicy mexican food will induce labor?